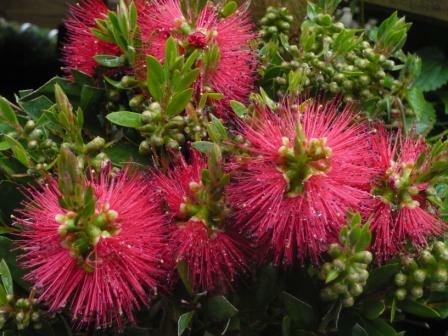 Callistemon is a native genus of Australia, with around 30 species of woody evergreen shrubs and small trees. 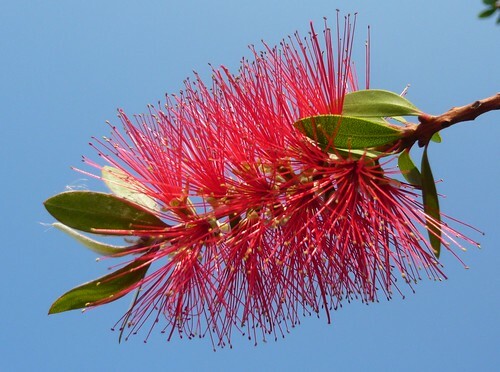 They are commonly known as Bottlebrushes or the Bottlebrush plant because of the striking appearance of the flower spike. The flowers on the ends of branches are available in numerous colours including yellow, purple, pink and occasionally white. Callistemon are members of the Myrtaceae family and similar to Calothamnus, Kunzea and Melaleuca. Callistemons can be propagated either by cuttings (some species more easily than others), or from the rounded seeds. Callistemon ‘Splendens’ is not the hardiest of the genus and needs a warm, sunny wall to do really well. Plants can be lightly pruned after flowering to keep them in shape. A low-phosphor fertiliser should be applied in spring and autumn. Mulching will help retain soil moisture and reduce weed growth. Callistemon pallidus or the Lemon bottlebrush has flowers of pale yellow with cream stamens. There are many cultivars including Austraflora Candle Glow, a low growing spreading plant. Suitable for the coast they are hardy down to 20º F. Callistemon citrinus has been grown at Kew since the 18th Century. Callistemon viminalis or Weeping bottlebrush has silky hairs on the branches and bright red flowers. The best forms commercially available are Hen Camp Creek and Luster Creek implying a need for summer watering. Callistemon pityoides – Alpine Bottlebrush is a hardy and attractive bottlebrush is available in alpine form that grows as a compact bush to about 3 feet tall.